Truck underride crashes are some of the deadliest on the road today. 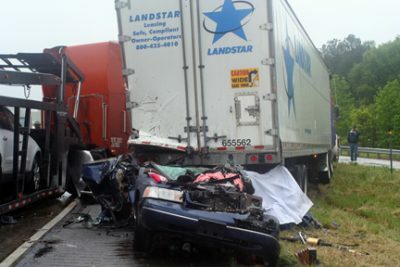 These gruesome accidents involve a car sliding under the rear of a tractor trailer, and usually involve severe head trauma or even decapitations. An underride crash in Georgia in 2013 that killed two teenage sisters has led their mother to devote her life to improving truck underride safety. In that crash, the family’s blue Crown Victoria was hit in the rear by a big rig, which spun the car around. It was hit by the same truck from the front and was pushed rear end first into the back of another trailer. The two teens seated in the back died. For many years, the US government has mandated rear impact guards on many tractor trailers, but there continue to be at least 200 deaths per year from these accidents. Critics maintain that the real figure is higher. Because of poor data collection, these critics claims that there are actually 4,000 such deaths per year. Safety advocates were heartened two years ago when the US government stated that they wanted to improve regulations for tougher protective steel bars on the back of trucks. However, the activists were upset to find that the NHTSA recommendation would only mandate that rear impact guards be strong enough not to collapse, but it absorb enough energy, to protect motorists who hit it at 35 MPH in a straight on crash. This was only an increase of 5 MPH from the old standard. Canada has had that standard since 2007. Because most new trailers in the US already comply with the Canadian standard, the NHTSA has stated that the proposal would only save one life per year and would add $229 to the cost of each new rig. The Insurance Institute states that a proper, updated federal rule should mandate that impact guards be strengthened especially near the corners. That is because cars that hit near the edge of the truck are more likely to suffer deadly passenger compartment intrusions. The American Trucking Association maintains that the 35 MPH standard is adequate, noting that if the trailer is made to withstand crashes at higher speeds, the car essentially is running into a ‘brick wall’ and the car passengers would die, anyway. We hope that the standard for truck underrides is improved so that people in offset crashes are better protected from serious injury and death. As in the specific case noted above, in some crashes, another truck or vehicle pushes the car into the rear of the trailer, leading to horrific injuries and death. Anyone who has suffered injuries in this type of accident that has been caused by pushing their vehicle into the rear of a trailer should consult with a personal injury attorney. Settlements of hundreds of thousands of dollars at minimum are usually possible in a truck accident caused by another party.